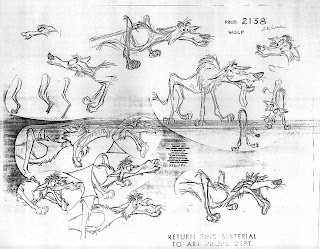 the loose wolf sketches are design drawings by milt kahl, the cleaner ones on the lower left are animation keys from a scene by john lounsbery. ps. your previous post of the single pinocchio model sheet are milt kahl's drawings as well. Thanks for the info, Andreas! Great to have a real expert on the subject on the blog.